Have you ever fancied swimming with feral dolphins? Or watching them play in their most natural environment from the lavishness of a sturdy speedboat? The choice is totally yours. ﻿If there's a heaven on earth, then let's start with the idyllic bay of Tamarin where Dolphin Venture Ltd operates to bring to you the most exceptional dolphin experiences. Bright sun, pearly-white sands and waters of alluring shades of aquamarine and cerulean blue contribute to the enchantment of this once in a lifetime experience - Interaction with the Dolphins. sel, 'Anna' and has been offering dolphin interaction in Mauritius for the past three years. ﻿With his developed instinct, know-how and passion he guarantees a 90% chance on each of his ﻿trip to meet the dolphins. Most of his trips are conducted early in the morning as this is the ideal time to enjoy watching the dolphins at their best. ﻿Here, we are not talking of five or six pool tame dolphins - far from that! 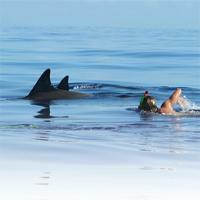 We refer here to the Wild Dolphin Encounter, as real as it gets! You may watch the dolphins' high flying athletics.The number of dolphins may vary according to the season. ﻿The sea around does absolute twinkle like diamonds.This part of the island with its untamed coastline has cliffs and the dolphins are found beyond the cliffs. In Mauritius two types of dolphins can be spotted - the Bottle Nose dolphin and the Spinner dolphin. ﻿Usually, bottle nose dolphins, which are bigger than spinner dolphins are more playful and much more open to human interaction. In boats, it is advisable to keep a distance of 50 metres from the dolphins for the well being of the mammals themselves. Dolphin Venture Ltd also proffers exclusive trips, for couples or families, where the boat is unreservedly at the disposal of the clients.Another feature of this tour is that on each trip, sandwiches and soft drinks are provided without any extra cost. ﻿Furthermore, Dolphin Venture Ltd also offers deep sea diving and water sports activities such as water skiing. Notice to all lovers of adrenaline rush! Security is a vital aspect and the company ensures all safety requirements are met. Everything is done to bestow the guests with an unforgettable experience with utmost security. ﻿It is also a non negligible fact that the dolphin company practices one of the most competitive prices available for this activity around the island. ﻿Dolphin interactions take place outside the lagoon around less than one mile away from the shores. I attempted the experience despite of all my apprehensions and was spellbound. It was so magnificent watching those fascinating mamals in their most natural unexplored habitat. The romantic little cove of Tamarin is one of the most elitist set in the Indian Ocean. One should not miss this unique opportunity gifted by nature and bridged by Dolphin Venture Ltd.